Give her breakfast in bed with an easy strawberry yogurt parfait. You can make lunch time unique with a seven layered picnic salad and finish the day off with a tasty broiled parmesan tilapia dinner. 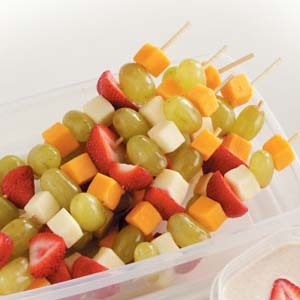 Try whipping up some chicken spread sammies or thread on some tasty and healthy fruits and cheese with the Fruitfully Cheesy Kabobs recipe. No matter what you decide to make for your mom on her special day, she will appreciate the work and love that goes into your cooking adventure. You can scroll down this page to see all the yummy recipes for mom or use the links below to make the one you want for your mother this coming special day. This recipe idea is a great healthy way for your mom to start off the day. It's so easy that even younger kids, with some supervision, can make all by themselves. 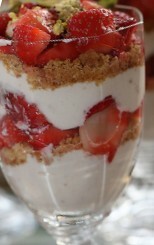 Layered with yummy yogurt, crunchy granola and juicy strawberries, this is sure to wake up anyone's taste buds. You can modify this recipe to add mom's favorite fruits and flavored yogurt. This salad is layered with healthy vegetables and topped off with low fat or fat free tasty ingredients. 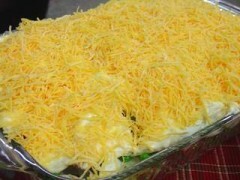 It makes a great dish for a family picnic to celebrate mom on her special day. You can use the left overs for a great side dish with dinner. 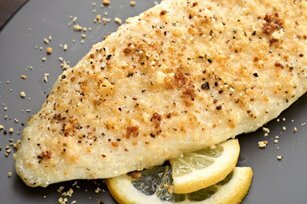 Try making the Mother's Day recipe (Parmesan Tilapia) further down on this page for your entree. Make mom a simple, easy and healthy lunch with these chicken spread sammies. 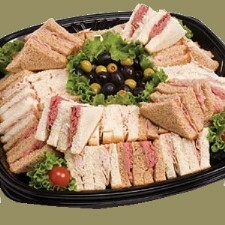 You can use different spreads, lunch meats or even egg salad to give her a variety to select from. Make sure to use whole wheat or whole grain breads to make these sammies healthier. Serve them to her in her favorite chair while relaxing or gather up the whole family for some fun, quality time together. This fish entree recipe makes for a great ending to a great day for your mom. With the light texture of the filet, the seasonings and tangy taste of the lemon juice, she is sure to eat the very last bite. Add some healthy side dishes for a meal she will always remember. This Mother's Day recipe is perfect for kids to make for their mom. No cooking is required on this and even little hands, with supervision, can help thread on the healthy ingredients to complete the kabob. Layered with different cheeses and fruits, it's one snack that mom will love to eat. You can add some veggies in the mix to give her lots of different flavors to satisfy her taste buds. These last Mother's Day recipes are a great, and somewhat healthy, way for mom to finish off her special day. Not only will mom enjoy these tasty treats, but kids will have a blast making them for her. Whether you want to make the banana pops or the cherry S'mores (or both) they are quick and easy and kids of all ages can help. The banana pops are so simple, but can be a bit messy. Using a half banana on a stick, covered in honey and then dipped into mom's favorite toppings they are a fun treat. These are oh so yummy and sticky sweet. The Cherry S'mores are a slight twist on an old time favorite. No campfire required for these treats. Instead you melt the chocolaty, marshmallow, dried cherry mixture in the microwave. Don't forget to let them cool slightly before diving into this dessert. In addition to these Mother's day recipes, try making her a fun frozen dessert with these recipe ideas. Warm up this cold winter with some healthy and hot soups. These are a great addition to any meal or as a quick snack during the day. Before you pile on the bacon bits, salad dressing and croutons, ask yourself it that healthy salad is still healthy. Read this article to understand why not every salad is a healthy meal. Controlling portion sizes can help you lose that excess weight. Check out this article to get a better understanding of proper portion sizes.